We are manufacturer and exporter of Tensile Testing Machine used to determine Tensile Strength of Fabric, Yarn, Rubber, Elastomers, Plastic, Paper, Wire Rope, Cable, Board, Plywood, Metal etc. Our Tensile Testing Machines are made by a highly advanced technology and experienced R&D and production team. We offer Digital Tensile Testing Machine, Computerised Tensile Testing Machine at a very competitive price. Our sales and service team take care, after sales service throughout the life of a machine. 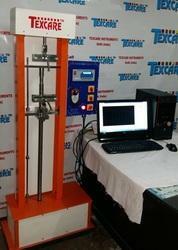 Computerized Tensile Testing Machine is used to determine breaking force of any fabric, Non Woven, HDPE Bag, Cable, Polymers, Rubber Sheet, Rope and Yarn Lea. Computerized Tensile Testing Machine is made of the finest material and thus produces very accurate and reliable results. Computerized Tensile Testing Machine consists of lower stationary base plate, a fixed cross tie on two supporting columns and a movable cross head using a lead screw and nut mechanism. The Tensile Testing Machine has been designed in such way that one testing space is suitable for extra-long test sample, having long elongation. Our company has been acknowledged for providing Tensile Strength Tester (Digital Model) to the clients. The reading directly come in kgf (Kilogram Force). Elongation of material is also measured by digital counter. Tensile Strength Tester is based on constant rate of traverse principle in which one end of the test specimen is held in a stationary grip, while the other end is made to move at a known fixed speed with the help of motor, gear box and screw arrangement. The load exerted on the stationary grip is sensed by a load cell and indicated by a digital load indicator. The microprocessor based Load indicator is sued in Tensile Strength Tester and has the facility of over load protection, peak hold and auto calibration. The frame of the Digital Tensile Strength Tester is fabricated from heavy mild steel sections to give the required rigidity and strength. It has various built-in safety arrangements such as over load and over travel protection. The equipment is finished in Gray & Blue combination painting and bright chrome/zinc plating to give it a corrosion resistant finish. The Instrument comes with a complete Instruction Manual; Electrical Wiring Diagram & Calibration Certificate traceable to NABL approved Labs. It is supplied with electrical parts which include micro-switches, Main switch, and relay etc. for safe and convenient operation. Protection: Over Load, Over traverse up & Down. Auto Stop: When Test Finish, At Over Load, At Over Traverse. With Window based Software licensed to customers. With RS232 Communication Port and Cable. We are manufacturer of Double Load Cell Tensile Testing Machine, one load cell having capacity of 10 kgf and another load cell of 500 kgf. This machine can be used for both low and high tensile range. Constructed using heavy mild steel for strength and stability. Incorporates various safety arrangements such as overload and over travel protection. Fitted with standard branded motor and gear box. Completely modular construction for trouble free maintenance. Corrosion resistant finish Comes complete with micro switches, main switch and relay. We are leading manufacturer and Exporter of Metal Wire Tensile Testing Machine, used for flexible wire of steel, copper, aluminum, tungsten, Brass and other soft metals. This machine is having Digital display for load and displacement. Machine is motor operated with safety features for over load and over traverse.